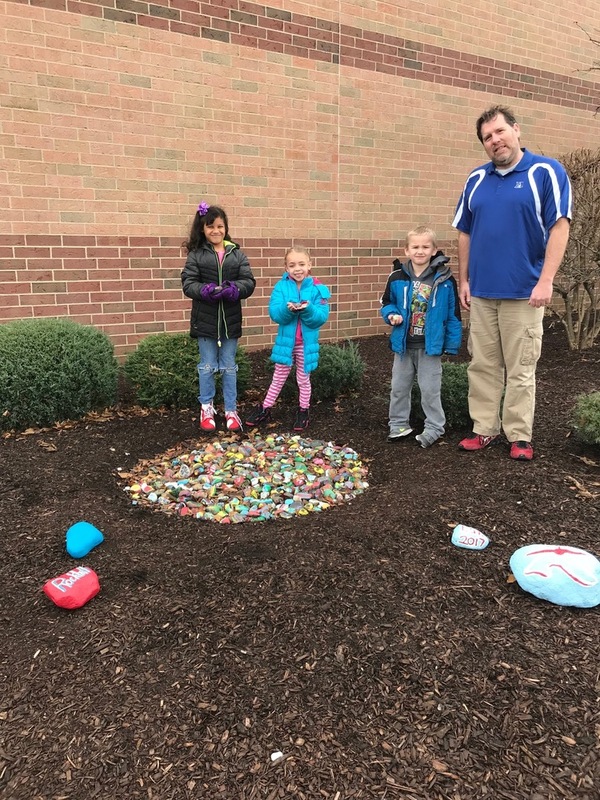 First grade teacher Addie Bender forwarded a social media post to Principal Balderson late this summer about a lesson in individuality and community using rocks. After Mrs. Balderson watched the post she couldn’t let the idea go. The post showed a photo of a colorful rainbow rock garden. Each rock was painted by a student in a unique way. The inspiration came from a book called “Only One You” by Linda Kranz. The book features rocks painted as fish as its illustrations and tells the story of a fish who learns that everyone is special but equal. Balderson took the idea of painting rocks to elementary art teacher Chris May. May washed hundreds of smooth river rocks Balderson had purchased and prepped them for his classes. He showed each of his classes in first through third grade at Rockhill a video of the book “Only One You." He explained the importance that we are all unique and different but we are all equal and part of a community. That served as inspiration for the students to paint their rocks in a special way that would be used at the school. “We wanted each unique rock to be painted differently to show the students individuality. We wanted them placed in a rock garden, to show how all of our uniqueness and individuality, comes together as a family. ” May said. The rocks were painted with acrylic paint that will stay on the rocks through the weather. All the rocks were then gathered and put in a rock garden at the front of the school building. Each year the garden can be added to, with each student represented in the colorful pool of rocks. We are a family at Rockhill and the rocks signify individual characteristics of our family members.